We have been getting involved in the art of somnolence here at the studio. This means we want to see how best we can achieve the most restful sleep. Here we see whether the cleverly named and well-advertised Casper mattress (ours the EU double - £575) might be the answer to all our dreams. Plus if you use our exclusive link you can save £50 in the UK & $50 in the USA off your Casper order - no coupon or voucher code required. From the shape and size of the distinctive oblong blue and white striped box it would be impossible to know that within it was a solidly made double mattress, but the weight of the box might be the first clue. Of course, the clever thing to remember is to make sure you open the box where the Casper mattress will be used, thus saving all that struggling to manoeuvre a full size mattress around and through small hallways and doorways. Once opened, the box has a welcome 'Good Night' presentation folder from Casper and within this is one of the simplest and best produced instruction sheets we've seen. There are four simple steps to unboxing and setting up your Casper mattress, adding up to just 46 words and three excellent and amusing illustrations, including a helpful dog - if only they were all as useful! Basically you pull the mattress out of the box, unroll it with the help of the outer plastic wrap and remove the inner vacuum-sealed plastic wrap. Once the seal has been broken the Casper mattress immediately draws the air into the foam and, literally before your eyes, it becomes a solid real mattress. One small gripe is that, as with other memory foam mattresses we've seen, there are no carrying handle loops on the mattress which would help if the mattress needs moving at any time. Although, once positioned, the mattress should not be flipped over, but simply rotated every six months. The design and finish of the Casper mattress is meticulous. All the stitching round the quality material is perfect and we see that this includes the hidden zip fastening of the cover. 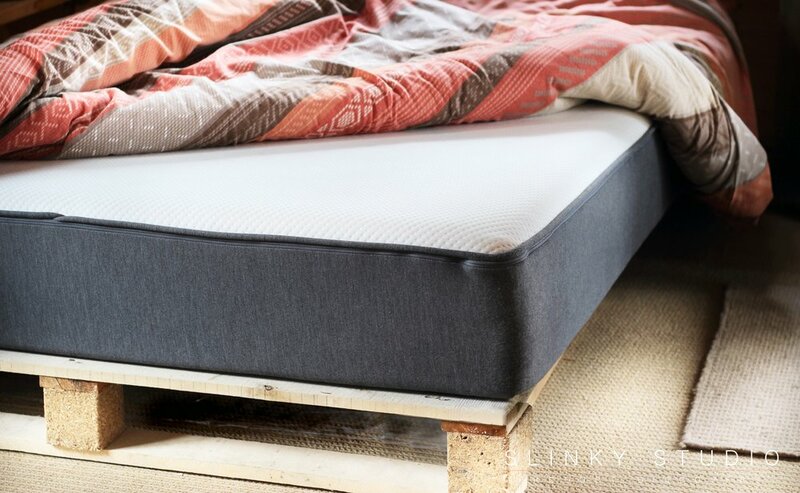 There are four layers, with support foam at the base, followed by memory foam and then latex foam which has more of a springy quality and is covered in a breathable mesh-like material. There is nothing we can fault in the design or finish of this mattress and all this is backed up with Casper's 100 night trial, with free pickup if you are not satisfied, and a 10-year warranty if you are. Now this is not to say we're lazy on the job here at Slinky Studios, but sometimes work can be so therapeutic, particularly when it means you must go to sleep! As soon as you lay on the mattress you feel it snugly take your shape as you are enveloped into the foamy layering - but this Casper mattress has a definite difference from other memory foam experiences, that latex top layer really does have a springy feel, meaning that you do not have the inert feeling that your body is stuck in the position you first take. If you turn over or move, the slightly springy layer allows for the movements to be made naturally and with ease. In achieving this Casper have laid to rest the one thing which made spring-based mattresses in some eyes better and, in our view, have produced something quite original. We noticed too that the top layer also retained our body heat and felt warm and cozy on cooler nights which is very agreeable. It will also keep you cool during warmer periods, although we have not had that many of these during our extensive trial of the mattress. We have found our sleeping experience on the Casper mattress the best ever; and with our double mattress it is notable that the slightly springy top layer does not inhibit the fact that you can toss and turn without bouncing your partner out of their sleep because the memory foam layer does not move as a mass in the way sprung mattresses do. During the time we have used the Casper mattress it has shown no signs of wear, the foam always regains its shape and it still looks as good as it did out of the box. Importantly, in this respect, if necessary the cover can be unzipped to allow for cleaning if it does become stained or grubby. Casper have produced a really clever and excellently manufactured mattress that puts to bed (excuse the pun) any complaints from those who feel they miss the spring from the old metal sprung mattresses when they first try memory foam; that extra thought put into Casper's top springy layer is ingenious and we think will benefit anyone's aim for a good sleep. Save £50 off your order by using our exclusive link.